Im new to the forum, my name is Sofia, originally from Argentina, now I live in sunny FL. I have 2 pet parakeets, Loui and Lizzie, who are in love with each other. I'll share some pics as soon as I figure out how to post. 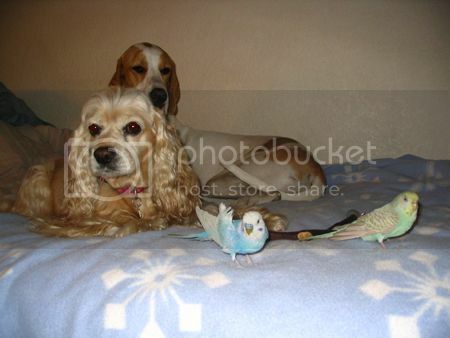 your budgies and your dogs are beautiful! i take it loui doesnt fly? do you have to do anything different for him than you do for your other budgie? i used to have a budgie that didnt fly. Glad to see you here it's get getting new faces (so to speak) and getting to the story of budgies all over the world. How did loui hurt his wing? or did that happen before you got him. Loui hurt his wing before I got him, the pet store owner thinks his mom stepped on his wing as a baby, but I don't know how it happened. He's a very happy bird, he doesn't seem to know he can't fly. He'll even strech his good wing and try to do it. He's around 4 yr old. He's the sweetest little gentleman. Lizzy is the opposite, she's the wild child, always getting into everything, and she can have her temper too. Well, im rambling on... thanks for the welcome, I can't wait to hear about your parakeets/Budgies!! Hi and welcome. Loui is absolutely adorable! Hello and welcome. I'm also new. Its really fascinating how the animals can learn to live with each other. I use to have a dog and a cat who would sleep in the same bad with each other and they would even eat from the same bowl. Welcome to the forums! :rip: Your pets are all gorgeous! Hi and Welcome. Loui and Lizzi are both very pretty. Stunning colors. Hi Sofia welcome to the forum! 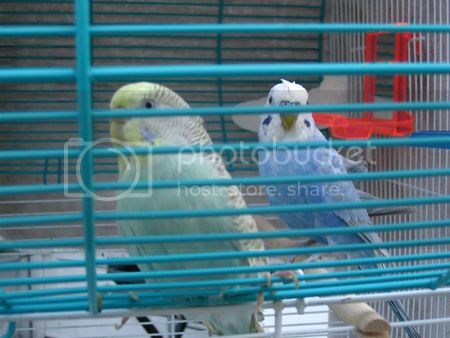 Your budgies are gorgeous, I especially love the colour of Loui! Do you have a closer photo of Loui's bad wing? I've got a budgie who can't fly too. His wing tips were biten off when he was one day old.